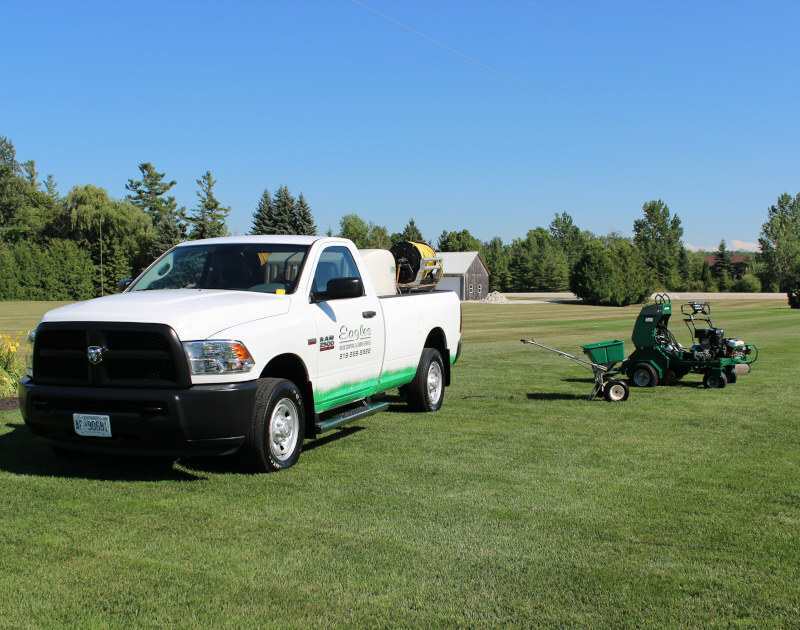 Using government approved environmentally safe products to manage weeds in turf which rob your grass of nutrients. Our weed management services produce a safe and weed-free lawn. Aerating your lawn removes cores of the soil and thatch allowing better air, water and fertilizer penetration. This encourages deeper roots and a healthier lawn able to withstand disease, insect damage and drought stress. This application is a mix of seed, fertilizer, mulch, a sticking agent and water which is then sprayed to produce an optimal environment for grass seed germination. When applied to a properly prepared seed bed area, it will prevent soil and seed erosion and produce fast germination and establishment. With proper watering and fertilization practices, your newly seeded area will be established as soon as naturally possible. This application can be used to overseed on existing turf as well. Using a seed feed compost mix after double aerating, this will help create a fuller, thicker turf. This service is done on existing turf. We apply safe biological products to control Grubs, Chinch bug and the larvae stage of the European Crane Fly (Leatherjacket). Any of these insects can devastate your lawn if not treated. With our non-selective vegetation control products, we can control unwanted vegetation on driveways, patio and walkways. For season-long control, repeat applications are required. Our exclusive high quality granular fertilizer is formulated to give your turf the proper nutrients needed to produce a thicker, greener and healthier lawn. Our 6′ mechanical brillion seeder integrates grass seed in the top 1/2″ of a properly prepared seed bed. This maximizes potential seed germination. Brillion seeding is mostly used on large open areas. Contact us for an assessment and we will come meet with you and discuss your lawn concerns. We will recommend a program specifically designed to give you the best possible lawn.